Heat 1 tbsp of oil in a pan. Add minced beef and stir fry for 5 minutes. In a bowl, mash the boiled potato and add minced beef, fried shallots, spring onion, salt and white pepper. Mix well. Fill up the Fried tofu with bergedil mixture. Put egg in a bowl and whisk with fork. Heat 2 cups of oil in a pan on a medium heat. Dip tofu in the bowl with the egg before putting it in the oil. To make the sauce, put all of the chilli sauce ingredients into a blender and blend till fine. 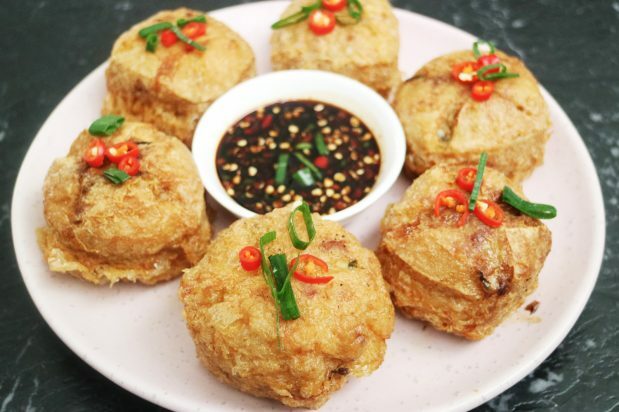 Serve the tofu bergedil with chilli sauce.